Yes, there were frequent thunderstorms, some localised flooding and a lack of very high temperatures – but then is this really unusual for June in Reading (or southern England)? Or might it just be a matter of ‘rose-tinted glasses’ leading us to expect scorchingly-hot/dry weather in June – and the fact that everyone over the age of 40 has recently been re-living the glorious fortnight of weather that occurred in June-July 1976. Let’s take a look at the summer of 1976 first. The summer came towards the end of a drought that could be traced back to April-May 1975. This drought (which had led to a recommendation for people to take a bath only when necessary – and then in no more than 5 inches [13 cm] of water!) was to end in September-October 1976 shortly after the appointment of a ‘Minister for Drought’; these months received about four months-worth of rain in eight weeks in Reading. So, making a comparison between 2016 and 1976 means disappointment is guaranteed! June was milder than average in Reading and across the UK – mostly due to cloudy, mild nights. But the maximum temperature in Reading in June was lower than that in May – and Reading actually missed much of the heavier falls that afflicted some nearby places. Much of England and Wales had a wet month but June 2007 and June 2012 were wetter. But north-east England and western Scotland were dry – and Shetland was quite sunny. However, Reading had the third dullest June on record – after 1990 and 1991 and I guess it is the dullness of June that caught the attention of everyone. What weather should June bring us in Reading? Temperature: June’s mean temperature (15.3 °C) lies about mid-way between May (12.4 °C) and July-August (17.6 °C and 17.3 °C respectively), possibly suggesting that June could turn out to be like a continuation of spring – or suddenly jump into summer-mode. 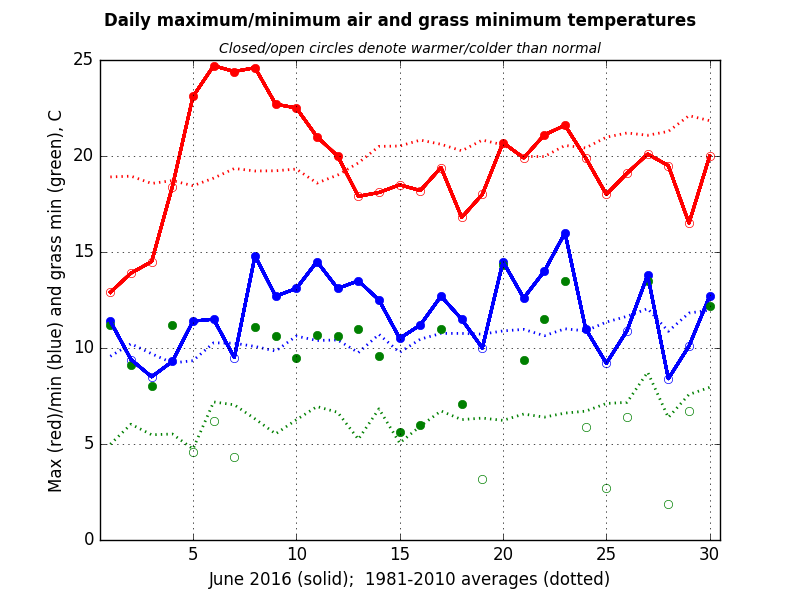 Only 5 June days reached 30 °C during 1981-2010 – July and August combined totalled 54 – which shows just remarkable the conditions in June 1976 actually were. Precipitation: June (average 45 mm) tends to be slightly drier than July (46 mm) and about 8 mm drier than August – seven Junes since 1901 have exceeded 100 mm, compared to 10 Julys and 14 Augusts. If we count a very wet day as one with 25 mm or more, then June saw just one while July and August each saw six in this 30-year period. The monthly average over the year in Reading of this quantity is 1 day – so June might be thought of as relatively free from such downpours – so when they do occur they are memorable and often associated with thunderstorms. Sunshine: There is little to choose between the three summer months. July is actually the sunniest month of the year on average (with 197.5 hours, or about 8 hours more than in June, but it does have an extra day in the month): August is about 2 hours sunnier than in June. Considering that June contains the summer solstice this is a little surprising. While the sunniest summer month in the Reading record did occur in June (in 1975, 306 hours, an average of just over 10 hours sun per day), so too did the two dullest (those of 1990 and 1991, just 109 and 110 hours, respectively). Statistics confirm that sunshine amounts in June are a little more variable from year to year than in July and August. So what did July/August 1990 and 1991 bring after a dull start to summer? Both July and August of these years were warmer than average in Reading and 35.5 °C was reached in Reading on 3 August 1990 – the third highest August air temperature on our long record. July 1990 saw only 9.5 mm in Reading (the fifth driest July on record) and August 1991 with 8.6 mm was even drier. All these four summer months were dry. And all of these four months had in excess of 199 h of sunshine in Reading – high values indeed for a summer month in Reading. So using analogue-forecasting methods might suggest the best of the summer is yet to come; maybe we should not cast a clout until August is out? Thanks to Charlie Williams for prompting this investigation.